Media Literacy 7 Edition In this media-saturated world, we must learn how to navigate through the overwhelming flood of information so that we can avoid the risks and maximize its potential to help us. 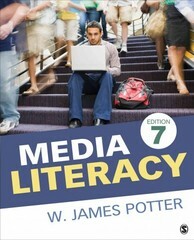 Media Literacy, Seventh Edition shows you how. Drawing from thousands of media literature studies, author W. James Potter explores the key components to understanding the fascinating world of mass media. In this thoroughly updated and revised edition, Potter presents numerous examples and facts to help you understand how the media operate, how they attract your attention, and how they influence you. Each chapter concludes with a set of exercises to help you apply the chapter material to everyday life and engage in a step-by-step process to increase your level of media literacy.